These pumpkin muffins get extra flavor and texture from the fresh or frozen cranberries, a little molasses, and a variety of spices. Add about 1/2 cup of chopped pecans or walnuts if you'd like. Raisins may be substituted for the cranberries. Heat the oven to 350 F (180 C/Gas 4). Grease and flour a muffin tin or spray with nonstick baking spray. In a medium mixing bowl, combine the flour, brown sugar, baking soda, cinnamon, nutmeg, and salt. Stir to blend thoroughly. In another bowl, combine the pumpkin, vegetable oil, milk, molasses, and egg. Whisk to blend and then add to the dry mixture with the cranberries. Stir until the ingredients are just moistened. Using a spoon, a scoop, or a 1/4-cup measuring cup, fill the muffin cups about two-thirds full. Bake for 25 to 30 minutes, or until a toothpick inserted into a muffin comes out clean. Cool in the pan for about 5 minutes, then remove to racks to cool completely. Keep the muffins in the refrigerator for up to 1 week, or freeze (see below). To freeze the muffins, put them on a parchment paper-lined baking sheet and put the pan in the freezer. When the muffins are frozen solid, put them in freezer bags and remove as much air as possible. Label the bags with the nam and date and freeze for up to 2 to 3 months. 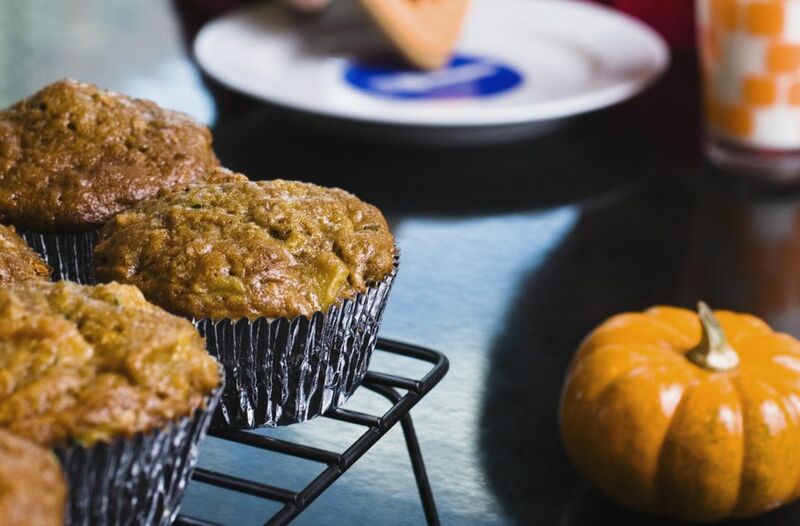 Defrost muffins on the counter or in the refrigerator. To reheat, wrap in foil and heat in a 350 F (180 C/Gas 4) oven for about 10 minutes.